Last year our grape harvest was a bust with the Japanese beetles eating their fill and leaving little to none for us. I have three favorite grape jam/jelly recipes and I cannot decide which is my favorite. Our old standby is a family heirloom passed down from my great grandmother. I found a Spiced Grape Jam in an old Farm Journal Cookbook and it has become a favorite. 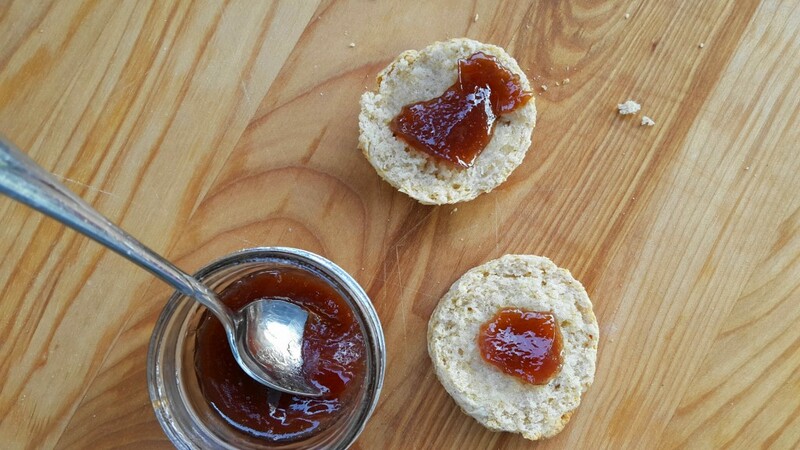 If you read my Spike Cherry Conserve recipe, you know how much I love Rachel Saunders so another grape favorite, Grape Jam with Orange Essence, is based on one of her recipes. With so little grapes this year, I decided to optimize the harvest and combine all of my grape jam recipes into what I hope will be a new favorite. Place grapes in a large kettle. Using a potato masher, mash the grapes as you bring them to a simmer over medium heat. Once the grapes start to simmer, cover and cook for about 3-5 minutes. Remove from heat and let cool slightly. Press pulp through a fine mesh strainer or chinois. Discard skins and seeds. Add the grape pulp, sugar, orange zest, orange juice, lemon juice and spices to the large kettle. Bring to a boil over high heat, stirring often. Continue to cook until done, 20-30 minutes, stirring frequently. Jam is done when it reaches 220 degrees F. Remove from heat and skim off any foam. Pour into sterilized jars, add lids, and tighten rings. Process in a water bath for 10 minutes. Yields 7-8 half pint jars. This didn’t turn out to be the most beautiful jam I have ever made. It’s color was a bit earthier than I would have liked for a grape jam. But, it is delicious and the house smelled like Christmas as I was making this with an aroma that I can most identify with wassail. The spices are pretty prevalent and I think that you could actually fool someone into thinking they were eating a spicy apple butter. That all being said, I still think this recipe is a success. 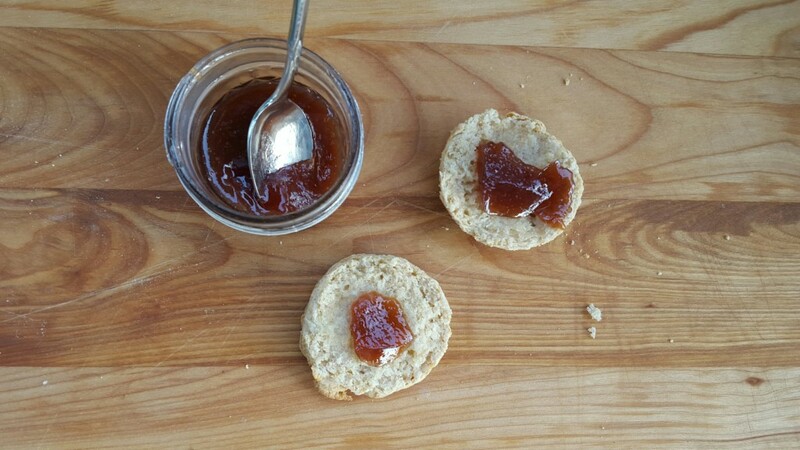 I first tried this jam experiment on my “Truth Telling” biscuits from a recent Food ‘n Flix posting. I have never thought of the combination of grape and orange in jam. I wonder if it works with lemon too. It sounds like they’re all winners to me so what a great idea to combine them! It’s so great to make something that doesn’t exist in stores… most of the commercial jams are totally predictable, while this one sounds like a real treat.